In a paper to be published in the September/December 2019 issue of TECHNOLOGY, a team of researchers from the Department of Biomedical Engineering at Illinois Institute of Technology, Chicago has developed a novel microfluidic device for measuring in real-time the cholesterol secreted from liver tissue-chip containing human hepatocytes. Their innovation lies not merely in the development of the first on-chip real-time assay for cholesterol detection but also in adapting the assay chemistry which is common in the conventional well-plate based enzymatic assay for cholesterol to microfluidic format and localizing it on the microscopic beads. This innovation can help researchers employing microfluidic cultures to study the effects of drugs such as statins on lowering cholesterol in real-time. Corresponding author for this study in TECHNOLOGY is Dr. Abhinav Bhushan, [email protected] Additional co-authors of this TECHNOLOGY paper are Andrea Cancino and Chaeeun Lee. This research was funded by NIH grant (DK095984). For more insight into the research described, readers are invited to access the paper on TECHNOLOGY. 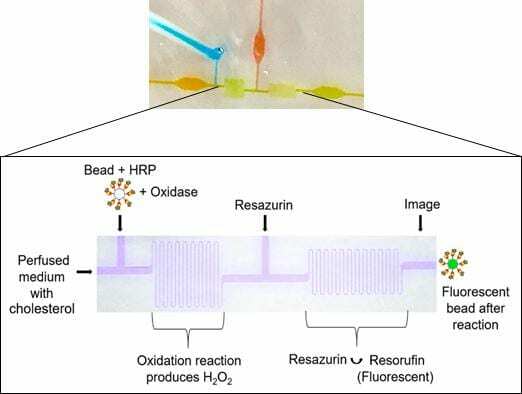 Caption: Microfluidic assay device which detects the secretion of cholesterol from human hepatocytes in microfluidic culture (Small insert) and the schematic showing the assay chemistry. Fashioned as a high-impact, high-visibility, top-echelon publication, this new ground-breaking journal – TECHNOLOGY – will feature the development of cutting-edge new technologies in a broad array of emerging fields of science and engineering. The content will have an applied science and technological slant with a focus on both innovation and application to daily lives. It will cover diverse disciplines such as health and life science, energy and environment, advanced materials, technology-based manufacturing, information science and technology, and marine and transportations technologies. About World Scientific Publishing Co.
World Scientific Publishing is a leading independent publisher of books and journals for the scholarly, research, professional and educational communities. The company publishes about 600 books annually and about 135 journals in various fields. World Scientific collaborates with prestigious organizations like the Nobel Foundation and US National Academies Press to bring high quality academic and professional content to researchers and academics worldwide. To find out more about World Scientific, please visit http://www.worldscientific.com.